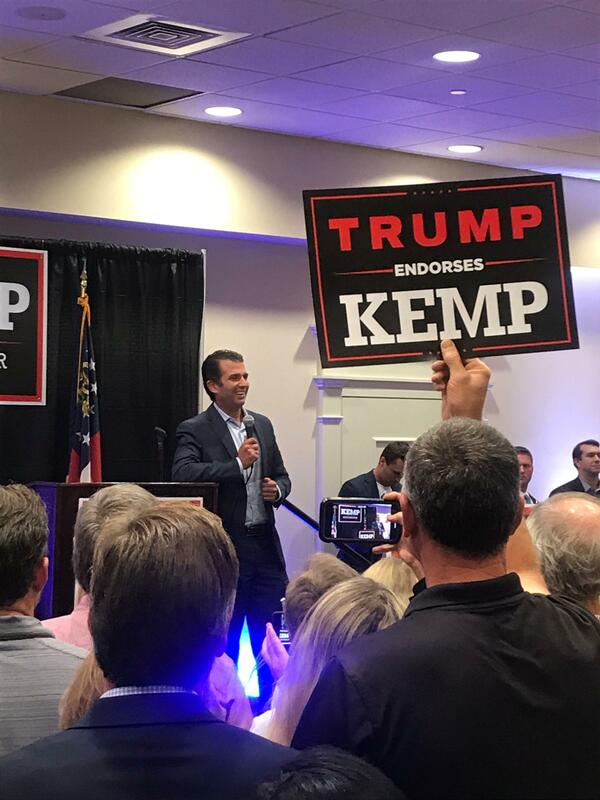 Donald Trump Jr. rallies for Brian Kemp in Athens. Kemp has received support from the president throughout the race. It was a President Donald Trump tweet that Kemp credited for giving him a decisive victory over Casey Cagle in the primary runoff. Trump Jr. spoke for about 12 minutes and spent most of his time criticizing President Barack Obama and touting his father’s successes. Trump Jr. also implored the crowd to get out and vote saying that would set the tone for Trump's re-election bid. "We need you to get Brian Kemp in the governor's office,” Trump said. “Because that's going to matter not just for 2018 but it's going to play a big part in how Trump performs in 2020." Neither Trump Jr. nor Kemp spent much time discussing policy or his opponent, Stacey Abrams. But Trump Jr. did praise Kemp as a fighter against the far-left agenda. Kemp took one shot at Abrams, criticizing her for raising money in California, saying their money won’t be able to buy a Georgia election. Earlier in the day, U.S. Sen. Elizabeth Warren rallied with Stacey Abrams in Clayton County.